This week the Modernising Medical Microbiology consortium at Oxford published the findings of a six-year study into the transmission of the hospital "superbug" Clostridium difficile. The research, which appears in the New England Journal of Medicine, shows that the majority of new cases cannot be traced to other infections in hospital, and indicates instead that there must be a large, as yet unidentified, reservoir of C. difficile infectious to humans. This finding is important because it suggests that there is a limit to which more and more intense hospital cleaning - important though it has been - can continue to have in reducing C. difficile infection. 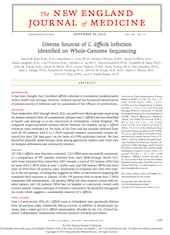 The research, which is the result of a tireless effort by a large number of my colleagues - notably David Eyre, Tim Peto and Sarah Walker - used bacterial whole genome sequencing to detect within-hospital transmission by searching for extremely closely related bacterial strains among more than 1200 cases of C. difficile infection that occurred in Oxfordshire between September 2007 and March 2011. The consortium is currently developing the approach for routine microbiology diagnostics and infection control, with a view to eventual roll-out across the NHS.